As we look forward to our next trip to Bali, we recap our previous trip here for our third and final night in Bali. We decided to go a little bit crazy and splurge for a night at the beautiful Amarterra Villas. 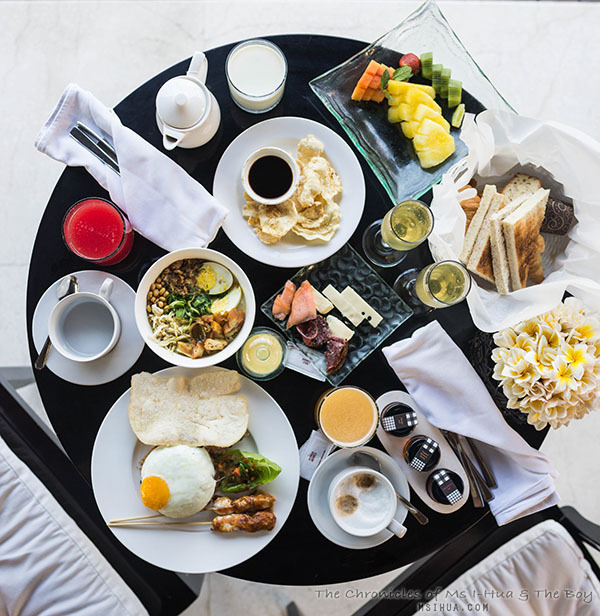 At around $500 AUD per night ($550 AUD if you want breakfast), it isn’t something that is easily affordable for most people. But we thought we deserved to reward ourselves a little bit with a one bedroom villa and a private pool. From the luxury of a 5 star hotel (Sofitel) down the road, we packed up our bags and were kindly chauffeured to Amarterra (they have the same parent company, and if you ask the lobby, they’ll arrange a transfer for you). 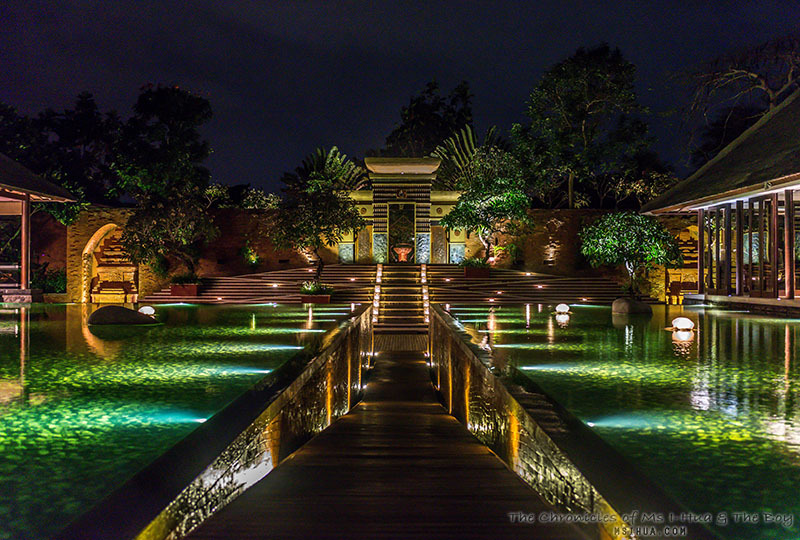 As we walked into the gates of Amarterra, we were instantly blown away by the beauty and layout of the resort. From the large pools of water that in turn hide a walkway, to the steps that lead up to the villas, everything was just breath-taking. Something you will also need to get used to if you are staying in these luxury hotels, is that they only ever address you by your last name with an honorific Mister or Miss/Madam. It took some getting used to, as we aren’t so traditional here in Australia. 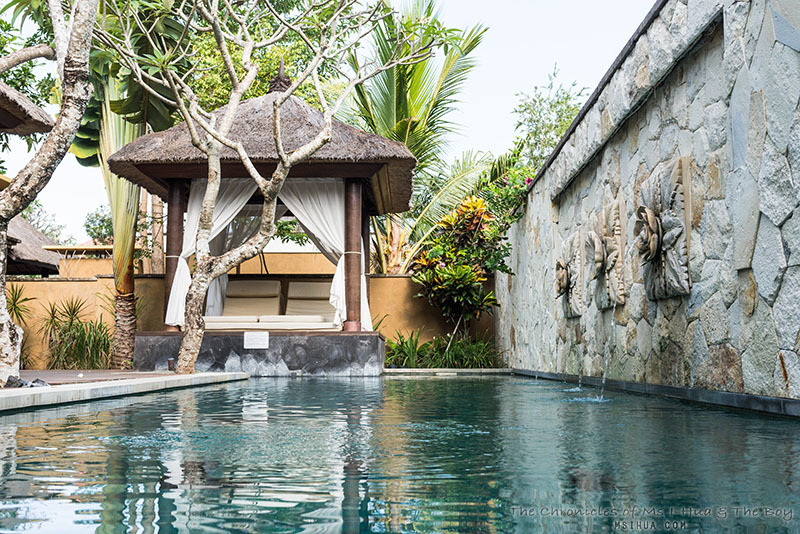 As we were shown into our private villa, our attention was instantly captured by the beautiful pool in our courtyard. I was like a child gone wild, as I wanted to run around the villa and plunge into the pool immediately! You can watch the video I made via instagram of our walk through the villa here. My only regret was that we didn’t think to pack in a giant float to lounge around in the pool. Lesson learnt, this time next week, I’ll be chilling on my giant unicorn float in our pool! Wuhoo! I particularly loved that the villa had two versions of bath facilities. 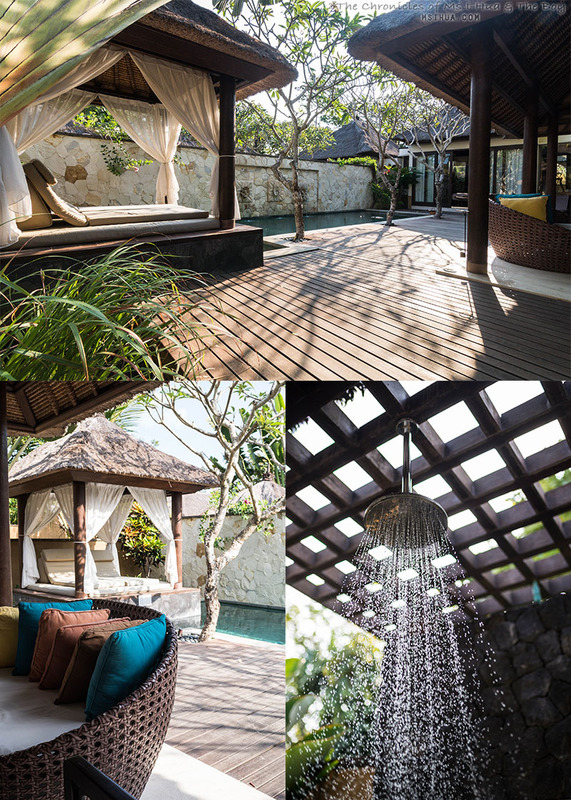 One is a proper bath tub and a shower inside the villa with windows overlooking the front courtyard and private pool. 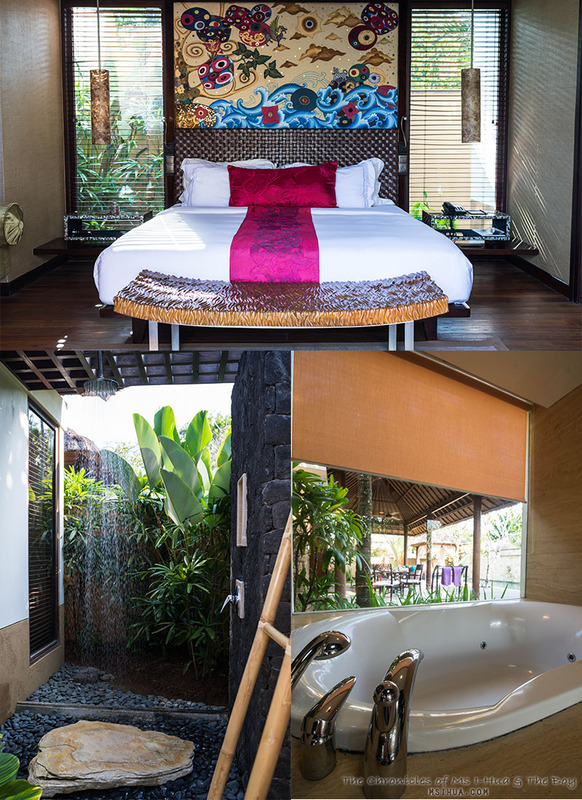 The second shower is an outdoor shower hidden at the back of the villa with rain shower, pebbles, stones, foliage set just behind the bedroom. We were also told that everything in the bar fridge was included into our stay, as well as the fruits that were on display in our room. Of course this meant that we popped open a bottle of sparkling and plunged into the pool to enjoy our special treat to ourselves! For breakfast the next day, we opted to have the full room service experience, instead of going outside to join the other guests in the usual hotel buffet. This turned out to be another great treat for us! The hotel staff turned up complete with our breakfast (we got carried away and ticked off nearly everything on the order menu) to set up our table. 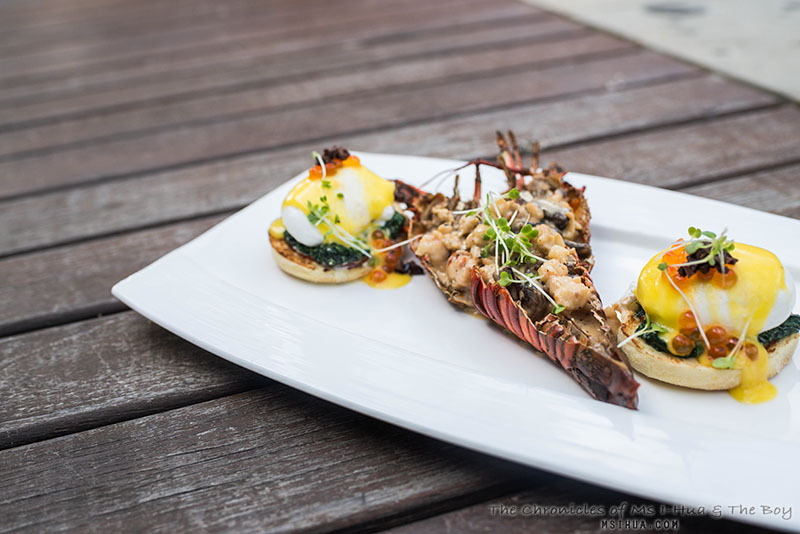 Of course, amongst the usual Indonesian breakfast fair, we also ordered the Lobster Benedict. Because we could. It almost felt a little ridiculous to be so spoilt! Here is a high speed video of our breakfast being set up. 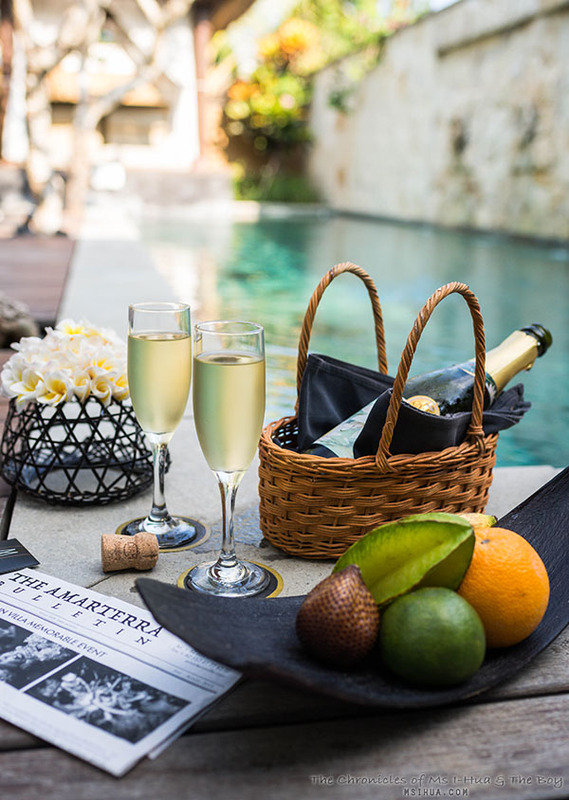 As the location of the Amarterra Villas is slightly off the beaten track, with its private villas and pools, the beach facilities isn’t as readily accessible compared to the other hotels located right on the beach front. 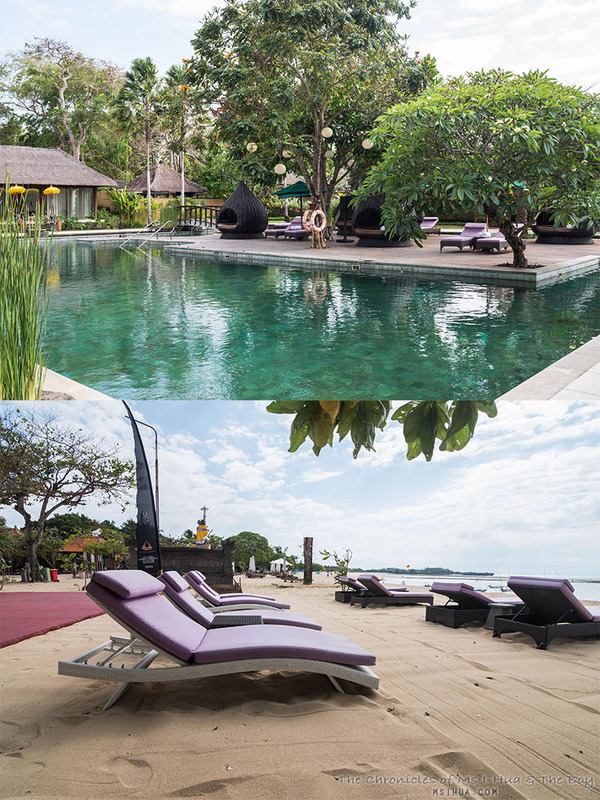 However, the Villas do have access to a small private beach area, located only a short walk (around 5 minutes) from the hotel’s back entrance. Because we wanted to see what that looked like, we walked out to check out the beach. It was ultra quiet and felt as if the whole area was cordoned off just for the two of us. 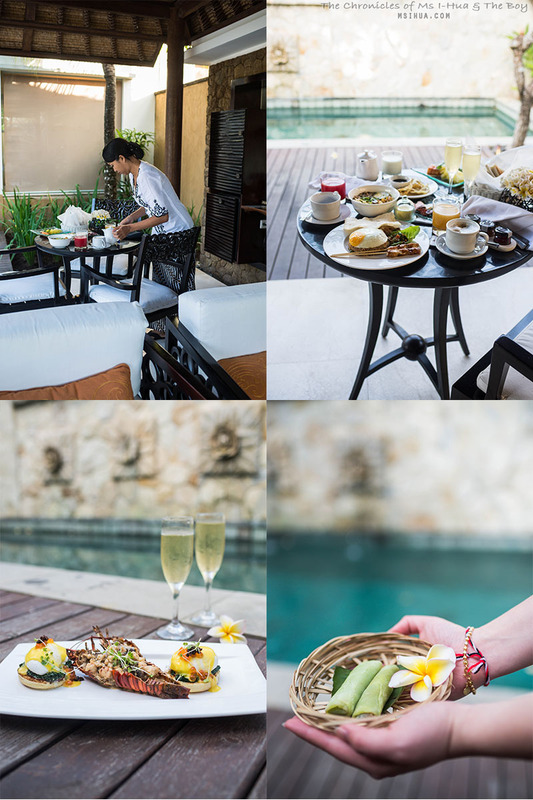 However, it wasn’t before long where we found ourselves wanting to return to our private villa and enjoy the facilities and comfort of the villas, including some very much needed massage. We booked our very first couple’s massage and it was so relaxing, I went back a second time without The Boy the next day! Absolutely gorgeous. Makes me want to fly to Bali like tomorrow.